I don’t want to pretend that Obama’s approach to Syria was a model of foreign policy precision, but in the end he did the right thing: nothing. Syria was a lose-lose situation for the US from the start. It’s unlikely that any intervention would have “worked”—whatever that means—and it’s almost indisputable¹ that even the slim possibility of an effective intervention would have required a massive military effort. A bit of bombing and some arms delivered to our allies-of-the-moment never had a chance. So whether or not you like Obama’s strategy, he did have a goal in Syria: to keep America out. And he did that. Not as crisply as he could have, but he did it. And of course Rhodes is right about Trump. He wants out but he also wants to stay in. He favors letting Putin fight in our place but he opposes Putin’s growing influence. He hates Assad but doesn’t want to arm the opposition. And what about the Kurds? It’s not clear if Trump even knows what a Kurd is. Frankly, it’s not clear if Trump could even find Syria on a map. 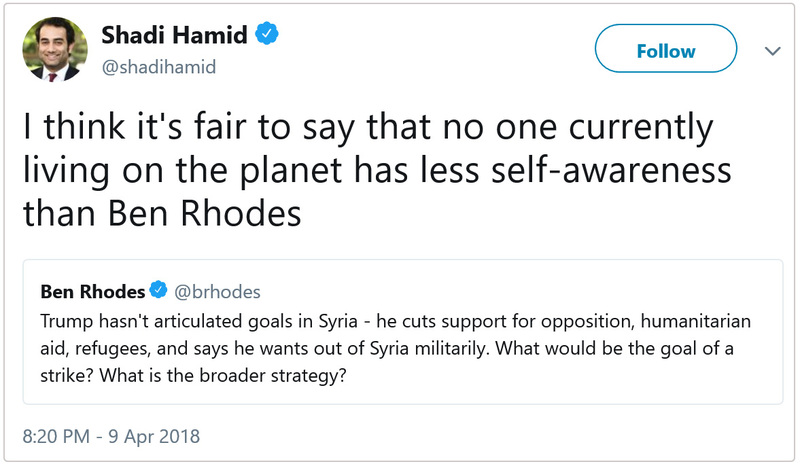 It’s not Obama or Ben Rhodes who lack self-awareness about Syria, it’s the Middle East hawks who continue to champion intervention but seemingly lack the recognition that America has never successfully intervened in the Middle East. The closest we came was in 1991, and in the long run even that turned out to be a disaster. I know it’s hard to accept that sometimes a region simply has to fight its own wars, but that doesn’t make it any less true. American military power can help on the margins, and it can protect American interests, but it’s simply not a tool for mediating a complex, decades-long contest between regions, tribes, and sects. After half a century of constant intervention and equally constant disaster, it’s the height of folly to criticize one of the few people on the planet who seems to get this. ¹I am keenly aware that many people nonetheless continue to dispute this.